So, let’s consider a series of workouts from the past 10 days. Fewer sprint sessions here than would be normal for me in this long of a block due to time crunch (an unusually high volume of Efficient Exercise and Paleo f(x) related work and meetings), and some absolutely cra-cra ATX weather. Rain? Really? I’d forgotten what the hell that looked like. As always, though (and even cooler than eating 50 eggs in an hour), is keeping in mind basic programming ideals: the Five Ts. Working through the eight planes of motion. Surfing the curve; waving (intensities) and weaving (modalities). *Compare/contrast this workout to the Friday, 9/20 squat clean/dip session. Keeping things the same…but just different enough not to fall into a rut. Took the day off to attend the Fitness at the Edge of Science conference. Good friend Dr. Doug McGuff proved to be by far the smartest guy in the room. Really looking forward to having Doug at Paleo f(x) next spring. *Adding a cumulative time element to this next time out. Will keep the same loading and the 21-rest-pause scheme. So just by taking a quick look at the rep schemes and loading here, you’ll notice the absence of any very high force/low velocity work. 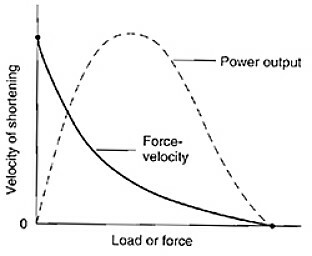 It just so happens that the ARXFit (how I incorporate that portion of the force-velocity curve) was in heavy rotation the week prior to this posted sweep of workouts. This is another aspect of “waving intensity and weaving modality”. “Frequency modulation” might be another analogy here. Whereas this particular 10-day snapshot contains no “extreme right” of the force-velocity curve, another 10-day span may contain 5 days worth. 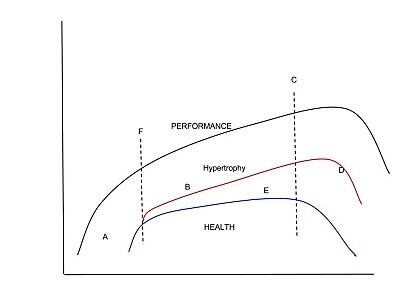 Remember, this won’t promote peak performance in a specialized manner, but it will promote a fairly high degree of “across the board” performance, while still preserving overall health; that all-important “C zone” depicted in the graph below. Under “Lunar Activity” article you asked for a good format for sharing your thoughts. What about an online video product? It could be updated and stuff could be shown for real. For a fixed price one could have a lifetime membership with occasional updates of certain videos that are out of date. Excellent idea, brother. And we’ll have the same type of subscription option set up soon with the Paleo f(x) video repository.